Study Chinese in Taiwan at our conveniently located and brand new school in Taipei. 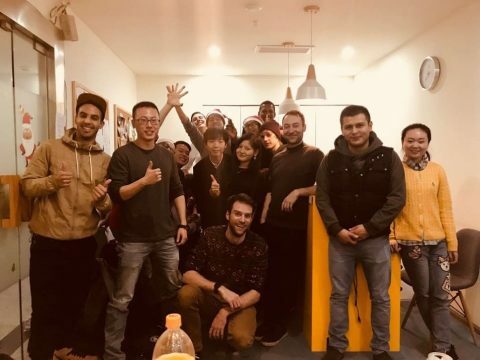 You will learn Chinese (simplified or traditional characters, your choice), experience the local culture, as well as making friends with your class mates. All our teachers are experienced and certified, to teach you more effectively and help you improve your Chinese speaking, listening, reading and writing skills. All of our group classes are small in size, we make sure that the teachers attention isn’t divided on too many students at a time, all so you can make faster Chinese language progress. Our school is a comfortable and friendly environment to study Mandarin and you will be made to feel at home at the best Chinese language school in Taipei. Carmen Garcia came to LTL to study Chinese in a small group class. Listen to what she has to say about her experience here. NOTE – The video is in Spanish with English subtitles. Sandra from New Zealand is retired and learns Chinese to keep her brain active. Listen to what she feels about her time at LTL Mandarin School. Study Mandarin the social way, with our small group classes. All our classes are led by experienced and certified teachers, and there will never be more than six students per class. This is so you can learn Mandarin quickly in a social environment without having to compete for the teachers attention. Learn Chinese, and make friends for life. Our school in conveniently located in the centre of Taipei. If you are looking for even quicker progress, why not combining your classes with a homestay, so you can practice what you learn in class with your host family. We take great care in selecting our teachers, so you can efficiently improve your Mandarin language skills. The small group classes cover a wide range of topics from daily life to culture and are a fun and social way of learning Mandarin. Our classes consist of 70% oral, and 30% reading and writing, so you cover a lot during your time at LTL. Our pre-arrival assessment will help us make sure that you end up in the right class with the right teacher. If you already know some Mandarin, then you are free to start on any Monday of the year. If you are a complete beginner, then you can start on anyone of these Monday’s below. NOTE – Prices are in New Taiwan Dollars (NTD). Be aware you can also pay in Euros, USD, CND, GBP, AUD, JPY and SWF. The exchange rate at the time of payment will be used. All textbooks and learning materials are included in the below prices which are listed in New Taiwan Dollar (TWD). The longer you book Chinese lessons at LTL, the greater your discount will be. Discounts amount up to 30% if you book for 12 weeks or longer. We also offer a special discount if you book your Chinese course over the Christmas period. Visit our Discounts and Supplements page to find out more. We also have a Small Group & Individual option for students who’d like to maximise their learning experience while studying at LTL. This course includes an extra 10hrs/week of tailored 1-on-1 classes, in addition to the 20hrs Small Group classes. Before you come to Taiwan to learn Chinese, we will do a personal assessment of your current Mandarin ability. This is done so we can understand your level, as well as your personal goals so we can place you in the right class whit the right teacher. We pride ourselves on finding the right class, and the right teacher for each of our students. The assesment will be done through Whatsapp, Skype or a phone call. Remember our assessment is not a test. The prices listed above, include everything. There will be no hidden fees, no registration fee, no accommodation finding fee, no textbook fees. The prices above are what you will actually have to pay. If you need, we can help you find accommodation in Taiwan. Find out more about our accommodation options in Taiwan. Our language school in Taipei is centrally located in the city meaning distance to school from your accommodation and local amenities is quick and convenient. How well qualified are your teachers? We owe our success to our teachers. All of our teachers are university educated, and hold teaching certificates. We also only hire already experienced teachers. Our hiring process for teachers is meticulous, and it shows in the classes you receive. What materials are used and what is a common lesson structure at LTL? The classes consist of all aspects of language learning, speaking, listening, reading, and writing. However, the classes are mainly focused on oral, which takes up about 70% of the class, and 30% is dedicated to reading and writing. Where will my classmates be from? Your classmates will come from all over the world. So far at LTL we have provided Mandarin classes to over 4,500 students from more than 100 countries. Will I be able to speak much in a group class? Yes, everyone gets the chance to speak and practice their Chinese in class. This is precisely why we keep the class size small, to give you enough opportunities to speak and practice your Chinese. We know the importance of getting every student talking Chinese as soon as possible, you are learning Mandarin in a local environment so you need to make the most out of this opportunity. Do you teach Chinese characters? Yes, we do. As the classes are in Taiwan, we are teaching traditional as well as simplified characters. However, the main focus of the class is still speaking and listening. How much Chinese will I be able to learn? While language progress of course differs for each person, we are very proud of the speed that we get our students ahead. For the small group course a complete beginner usually knows survival Chinese to get around within two to four weeks (HSK1), can have basic conversations after two months (HSK2), more complex conversations after five to seven (HSK 4) and can reach fluency within a year (HSK 5 to 6). Students who live in a Taiwanese Homestay, choose the small group & individual classes or take part in the Chinese Immersion Program, progress faster than those who don’t. What about when I finish my course? Lots of students are worried about how they can keep up their mandarin practise when they finish their course with LTL. This is why we offer an online continuation course, so that students can keep studying with their LTL teachers and materials when they return home. Choose from a number of our Chinese Gap Year programs and explore China whilst studying Mandarin abroad. Learn Chinese with our Immersion Program or and build your own Chinese Gap Year. Learn Chinese in Taiwan with our Semester Program, specially designed to help you become fluent. This is an intensive program spanning 18 weeks, or 36 weeks. This program is also great value for money.